Getting wider/more internet bandwidth are not necessarily a good solution to achieve high speed internet connection. It will need some network management or in this case bandwidth management to queue all traffic accordingly, so every data packet traveling to and from the internet will go smoothly and will automatically efficiently speed up the internet connection and/or data transfers. 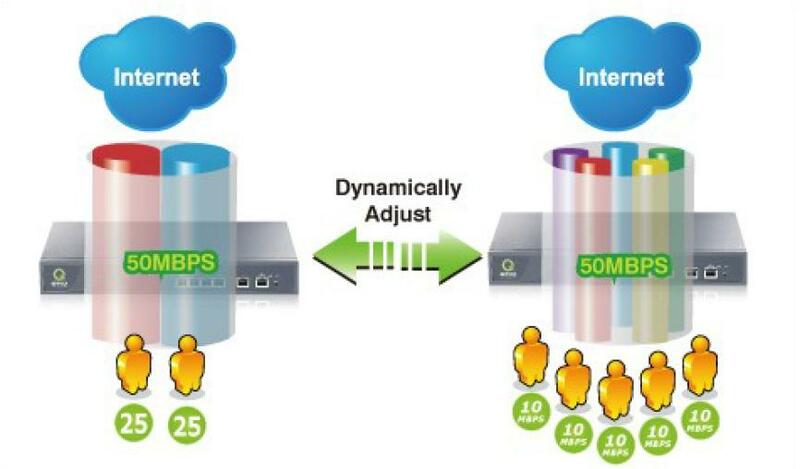 For example just as the picture ilustration above, a customer subscribe to 50 Mbps package and the customer are using Infotek Bandwidth Management system. The customer have multiple users using pc, laptop, smartphone and gadget. When there are 2 users actively using the internet in the same time, each users will be getting 25 Mbps bandwidth. When there are 5 users actively using the internet in the same time, each users will be getting 10 Mbps bandwidth. These process are fully automatic and changing very fast in miliseconds. 1 user active, 50 Mbps all used by only 1 user. 2 users active, 50 / 2 = 25 Mbps for every user. 5 users active, 50 / 5 = 10 Mbps for every user. 10 users active, 50 / 10 = 5 Mbps for every user. 50 users active, 50 / 50 = 1 Mbps for every user. Efficient bandwidth usage means saving lots of money without sacrificing network performances.